Andersen Bakery shops in Tokyo which highlights the best of Japan's baking traditions. Andersens now operates some of the leading and most innovative bakeries including world-famous brands such as Takagi and Little Mermaid. They produce signature products with fresh toppings and fillings and superb. Check out their "Danish" bakery in San Francisco and Copenhagen.. Here is an example of a commercial bagel sold at convenience stores. It is soft, wonderful aroma and includes the cream cheese! Japanese bakers rarely cut corners. They also look for efficiency. The trend now is to formulate high-quality products with ingredients that are natural and ready to use. This includes: frozen, dried, and puree as well as powders. Even the traditional masters innovate with these new products. For example they coat products with blueberry powder and use purees to top cheese cakes. A typical craft bakery in Japan is far smaller than those in the USA. They rely on just-in-time delivery of ingredients on a daily basis. Suppliers deliver precise quantities of frozen and dried blueberries in 1 kg packs. (2.2 lbs) Purees are delivered in 1 litre containers (2 pints). Recently, bakers are discovering the range of blueberry ingredient solutions such as dried, lquid and powders. Dried blueberries have been around a long time in Japan, but mainly used in snacks. While big wholesale bakeries may use dried blueberries sparingly small amounts of dried fruit -- craft bakeries make dense rustic loaves with high percentages of dried fruit. Infused-dried blueberries are ideal for breads, bagels and other items where the product must stand up to mixing and baking. The low water activity and firmness of the dried blueberries keeps them whole in the mixing process. Blueberries can be seen prominently in the end product. Above: Japanese bakers call the millennial generation the "Curry Culture." This pickled blueberry is from Okinawa (far south Island Chain). Bakery Team Japan 2015 - Bakery World Cup Champions. In this edition we highlight craft baking at its best! In preparation for the Patisserie & Baking Exposition Japan (P&B) in Tokyo, I was asked to prepare a presentation for craft bakers on blueberries. I soon realized that we have a lot to learn from these serious artisans who are always in the running for top awards at the Coupe de Mond -- World Cup of Baking -- every four years. In this tribute, I present my eight take-always from Japanese baking with a blueberry twist! This cheese cake is marketed as "Godzilla Berries!" Note the use of blueberry puree to top the enormous mountain of cheese. Asian pastry chefs love to load fruit onto cakes, pastries and specialty items. When we started working in Japan, fresh blueberries were a summer treat. Fresh blueberries are available all-year long in all regions of Japan. Bakers prefer big-plump-highbush blueberries. Suppliers deliver fresh blueberries daily. Bakers sometimes apply natural glazes to the berries for a nice sheen. Above: Here is my favorite specialty store in Japan called St. Corsair. This pioneering company with shops all over Japan produces jams, jellies and compotes with high percentages of blueberries. Recently they started a production facility in Oregon to get close to the blueberries! Above: This is a European-style pastry with a Japanese twist --cheese and blueberry! Look at the wonderful fruit identity! Bakeries are now preparing signature fillings with high percentages of fruit and customers appreciate. We have seen signs in bakeries touting the high fruit content. Decades ago when I first visited Japan, I searched for blueberries in bakeries. It was common to see one small blueberry on top of a muffin called a "blueberry muffin." In absence of frozen or fresh, some bakeries would use bakery fillings fill the muffin. Japanes customers love neat and tidy muffins! 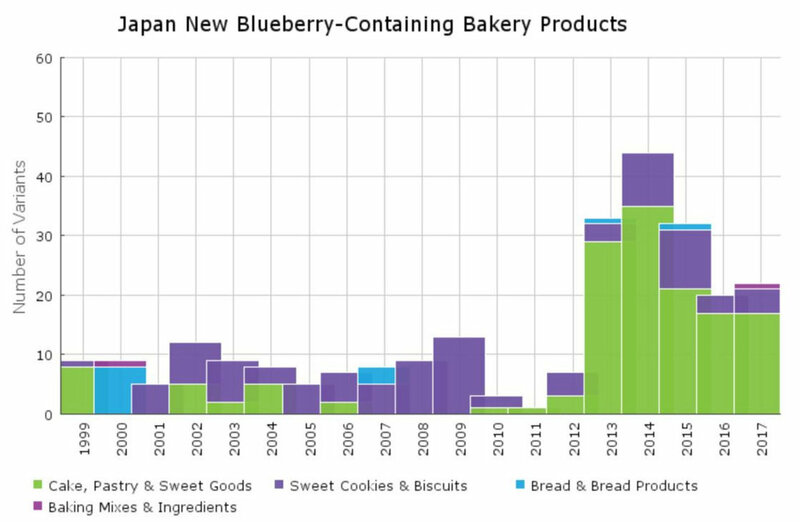 Ten years ago, USHBC introduced the "ultimate blueberry muffin" to Japanesee bakers which included 50 percent frozen blueberries compared to flour weight. (This is how bakers measure fruit content) This formula has caught on and this year we will offer the Real Blueberries ™ Seal to bakers in Japan. Japanese bakers are proud of their historical legacy. From introduction by Portugest centuries ago --today bakers produce Castella cakes (above) with layers of a paste made from blueberry puree. It is a best seller especially in the South of Japan! UHSBC participates in Japanese baking industry activities including the Patisserie & Bakery Exposition Japan 2018 (P&B). 小麦 is the Japanese symbol for Wheat. Actually it is a "Katakana" symbol from China as wheat is not native to Japan. When we think of Japan it is all about rice and rice flour which is known as mochi. • The first wheat probably arrived in Japan in the First Century AD over the Silk Road which stretched from Central Asia to Japan. It was surely a novelty and was establshed in small pockets in the North of the country where rice does not grow naturally. • In the 15th Century, the Kurofune (Black Ships) contacts from Portugal and the 16th Century Rangaku (Dutch Learning) enclave in Kagoshima (South Japan) brought in some of the European traditions of wheat-based foods and baking. Some of the most popular foods such as a rolled and filled cake called Castella (se above) came from Portugal and exist today nationwide Japan. • During WWI, defeated German soldiers were taken from their enclave of Qingdao, China (A German concession and trading port). They were settled in villages in remote areas of Japan. The Japanese became fascinated with all things German including baking and opera. One of the soldiers was a skilled baker from Bavaria named Karl Juhheim. He eventually settled in Japan and established a chain of bakeries that still operate. Juhheim was one of the pioneers in bluenerry baking in Japan! • After WWII, wheat and flour were shipped to Japan from the USA for humanitarian feeding. To many outside of Tokyo, wheat was considered a famine food and a poor substitute for rice. The US Wheat Associates (trade Association of wheat growers and millers) worked with millers in Japan and established bakery training programs. This included primitive "oil- barrel" ovens in the streets. Breads at that time were the soft white pan breads that are so popular today in Japan. Today, baking ingredients including are distributed by some of the same milling companies which started with the US Wheat activities. .
• The 1960 Olympic Games spurred the development of a Japanese hotel and restaurant infrastructure to receive the world. Modern hotels and canteens were established including the New Otani and Okura. Journeymen French and German chefs flocked to Japan to fill executive positions. The standards of Japanese baking rose fast to international standards. • A new generation of Japanese bakers rose to prominence in the 70s and and soon teams from Japan were capturing medals at international bakery and culinary competitions such as the Coupe du Monde de la Boulangerie (World Cup). Now: Blueberries are considered a special ingredient in Japanese baking and the story continues today with USHBC FoodTech activities in the sector! After the oil is pressed, here is what is left. The seed fiber of powder is used in facial scrubs and also in food products. Check out the Blueberrytech Blog in July for updates in the field and coverage of blueberries at P & B! Thanks for reading the Berry Latest. You are receiving this as you are in the business or else we have met at an exhibition or event somewhere. If you enjoy, please let me know at tpayne@blueberrytech.org If you do not want to receive in future let me know and we will handle it immediately! Please pass the word to your colleagues and check out back issues of the Berry latest at the link below.